Slip and falls are the most unpredictable injuries that may happen. Anywhere and anytime it is quite common to see people slip and fall in shopping malls, grocery stores, hotels and at work. Seemingly simple these accidents are dangerous and deceptive – from backaches and simple swelling to more severe injuries and even death. There is a difference between slip and fall as friction between a person’s shoe and the surface may result in a slip. A fall generally takes place from a height but can occur from a level surface. In such cases if the victim is not at fault but the slip and fall is due to the negligence of another person or business contact Williams, Ristoff & Proper. A slip and fall accident is a common term used for an injury that occurs when someone slips, falls or trips as a result of a dangerous or hazardous condition on someone else’s property. In the State of Florida, in order to hold a property owner responsible or liable for a slip and fall accident, it must be predicted that their negligence would create the hazardous situation because it is the property owner’s responsibility to maintain all of the property’s common areas in reasonably safe conditions. For a sound slip and fall case, it must be shown that a dangerous condition existed, the owner knew of the condition, the dangerous condition presented an unreasonable risk of harm to the person on the property, and it must be the case that a reasonable person did not anticipated the condition. For example, if a two-liter soda spills in a grocery store, and the store has either not noticed the spill or has not cleaned up the spill until the next day, it could be argued that it was foreseeable that the grocery store’s negligence in failing to clean up the spill would result in a slip and fall accident. For slip and fall accident cases, it is of utmost importance to have an experienced personal injury attorney on your side. The experienced personal injury attorneys at Williams, Ristoff & Proper, understand the importance of careful investigation and detailed preparation that is necessary for a successful slip and fall case. 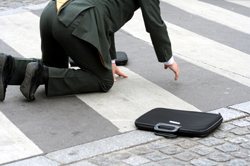 If you have or a loved one been injured in a slip and fall accident contact us today. We will evaluate your situation and provide you with professional advice based on your circumstance, call (727) 842-9758 today.